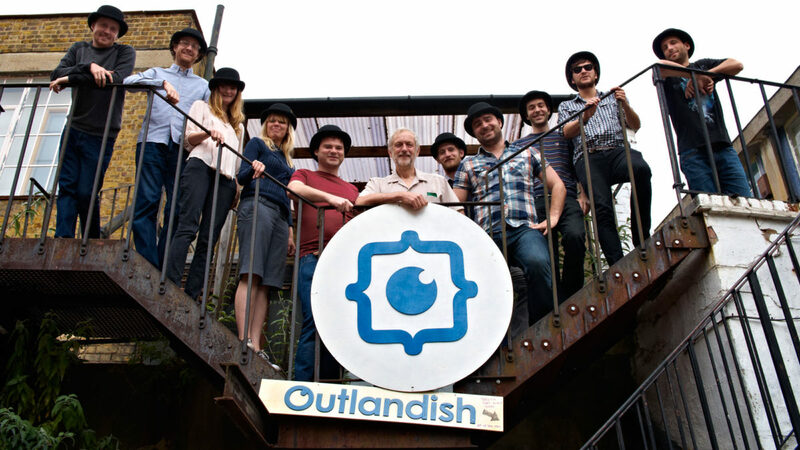 Labour Party leader Jeremy Corbyn joins employee-owners at London tech startup Outlandish, a worker co-operative. By focusing on the needs of business and the commanding heights of the economy, the Government's Industrial Strategy ignores the real solutions to the productivity crisis. Just hours before the Chancellor delivered his budget last Wednesday, the Office of Budget Responsibility (OBR) revealed the scale of the damage done by 10 years of under-investment and austerity. The figures released by the Government’s own independent economic advisors are stark. The damage done to Britain’s economic productivity (output per hours worked, which has flat-lined since 2006), they announced, is permanent, and unlikely to ever return to pre-crash levels. That matters, because rising productivity means gains across the economy. And those gains, if fairly distributed, mean higher wages and higher living standards for all. If the OBR is right, and productivity remains stagnant for the foreseeable future, things will remain tough for many. As we wrote last week, our current situation is an all-too-predictable result of a decade of Government policies which have favoured business short-termism over the interests of employees and consumers. As a result, the UK now ranks 5th in productivity out of the G7 nations. Greece is the only developed country where real pay has fallen further. Even the Government acknowledges there’s a problem, which is why it launched The Industrial Strategy Commission, which issued its final report earlier this month. The Report outlines five foundations of productivity, what it calls ‘ideas’, ‘people’, ‘infrastructure’, ‘business environment’, and ‘places’. Around each of these foundations, the Report recommends a set of long-term solution to falling productivity levels. Instead, the Industrial Strategy focuses on the productivity levels by raising investments for corporations to improve R&D, increasing funding for transport, digital infrastructure, and maths education, and improving regional connections within cities. These proposals help advance manufacturing from a technological and skills perspective, but won’t be effective as long as employees don’t have a voice in the businesses they work for and are deprived of fair wages. Britain’s productivity crisis can’t be solved from the top-down. Boosting productivity begins with paying workers enough to live on, and in giving employees a vested interest in the success of the business they work for – things the co-operative movement has always believed in, and which are hard-wired into the co-operative model itself. We’ve identified five key solutions to the productivity crisis that will benefit both workers and employers, growing community economies from the bottom-up. Companies that share the risks and rewards of business with their workers are more productive. A 2007 Treasury review found that giving employees financial stake in the success of their business can boost long run productivity by as much as 2.5%. The government should acknowledge the value of employee ownership by offering tax breaks to firms that participate in profit sharing and mandating employee representation on company boards. Creating a new generation of mutually-owned building societies and savings banks will shift the focus from short-term dividends for shareholders to long-term investment. Current legal and regulatory burdens heavily favour the PLC model, preventing co-operatives from competing in the market. The chancellor should support Labour’s commitment to doubling the co-operative sector, enhancing innovation and improving wages while lowering prices for consumers. Regional and devolved governments must be given the power to shape sustainable economic growth. Regional devolution allows local authorities to support small businesses that boost the economy by investing locally. This would require businesses that employ over 50 staff to distribute 5% of their profits among workers, increasing wages by up to £1,200 per year. There’s a strong correlation between these models of inclusive shared capitalism and increased productivity.